Monkey Stocks League Update #1, plus Prize Info! Well, month 1 is over for the Monkey Stocks League Challenge and what are the scores on the doors? 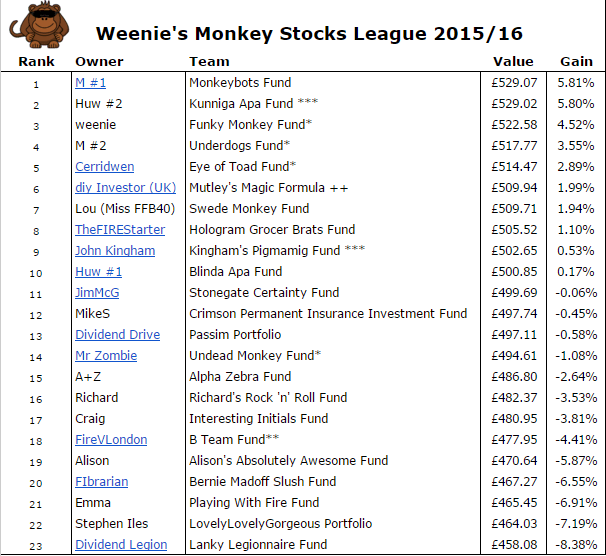 Below is a snapshot as at the close of trading 30th October 2015 and currently leading is M‘s Monkeybots Fund! The Live table (during trading hours, Rank and Value will be updated automatically) and full portfolio listings can be found here (now also via right sidebar). M is doing well at the top as her ‘Dogs of the FTSE’ stocks (Underdogs Fund), are also up there – both have been tussling with Huw’s ‘expert’ stocks (Kunniga Apa Fund) throughout the month! It’s good to see that I’m still up there too, as well as Cerridwen’s Eye of Toad fund. Mr Z’s Undead Monkey Fund was riding high at some point in the month on the back of the soaring share price of Evraz plc but appears to have fallen towards the end. The other real portfolio, FireVLondon’s B Team Fund is struggling a little but it’s still very early days. It’s been interesting to see the volatility of shares jumping up or dropping dramatically according to what’s in the news, latest profit announcements etc. What do We Want? Prizes! I’d originally stated that I was running this league for fun and that there would be no prize. 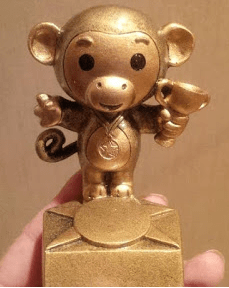 Yes, the winner of the Monkey Stocks League Challenge will receive this coveted little trophy! If I run this league again however, it’ll be one entry per person! Anyway, the trophy purchase hasn’t come out of my own pocket as such since I used money I received via TopCashback* to buy it, although I will pay to post it out to the winner. Unless that winner is me – Go Funky Monkey Fund! 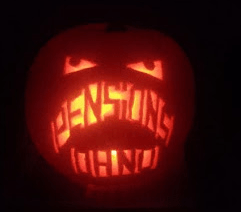 Anyway, Happy Halloween all – here’s the ‘topical’ pumpkin I carved for the competition at work – it didn’t win but got a few chuckles! This entry was posted in Blindfolded Monkey, Monkey, Portfolio, Shares, Work by weenie. Bookmark the permalink. Serious pumpkin, that's a work of art! Wow! I'm making an impressive 8% loss… I guess this is why I don't choose my stocks at random haha! M – now there's a prize I'm gunning for that top spot. Still 11 months to go for your picks to be flying again, Mr Z! It's early days yet – some of the random picks are showing profits. Will be interesting to see how it all finishes in the end! It's a really cool trophy M – I want to keep it myself! I'll sort out some engraving too (not personal engraving though). Haha, glad you liked it! First time I've tried anything so intricate and I was quite please with the results. The winning pumpkin was amazing though so must try harder next year! It's changing so much every time I look at the league table! Very exciting to follow. Yes, it is very exciting to follow – when I first loaded up the details, I was constantly checking (yes, even a work!) – I check most days now, usually at close of play – the league could be anyone's, still 11 months to go! Thanks and yes, it did get some laughs in the office, although when the CEO saw it, I heard her say it was "interesting…" haha!